Galactic Weaponry » The Shadow Archive - Analyzing and Creating some of Fantasy Flight Games' Living Card Games. Focuses on Star Wars, Lord of the Rings, and Call of Cthulhu/Arkham Horror. You were probably expecting me to talk about Darth Vader, a unit that looks like it’s going to really alter the way the game is played from the earliest turns, much in the way that The Tarkin Doctrine really changes the way the early part of the game plays out. However, FFG just recently “previewed” or spotlighted Vader, so I’m not going to rehash anything there. I believe he’s easily the most powerful objective set in the box, and will both be a staple of Sith decks going forward and will make early turns that much more difficult for the light side… meaning A Hero’s Beginning and Solidarity of Spirit will be even more important than they already are. Instead, I want to talk about a character closer to my own heart: The Inquisitor. It’s not terribly focused; it has a loose theme but it’s not blatantly synergistic the way Shield Generator Assault or even Fall of the Jedi is. None of the cards are blatantly powerful, unlike Emperor Palpatine and Echoes Yoda. It doesn’t have a resource, limiting the decks it can go in. By not having a resource it’s fighting with very popular sets like Brothers of the Sith and The Reawakening for deck space. Even if all the cards are good, it’s not immediately apparent how they’re meant to be used. It’s not a “build-around-me” set that gives deckbuilders ideas with which to start a new deck. So if it has all these weaknesses, why would anyone want to run Encounter at Stygeon Prime? Well, beyond the fact that it’s a very fun and very flavorful set, I actually think that this is a potent support set that people should consider, as it offers support options not available in other Sith support sets. Sith support sets tend to look a lot like Jedi ones: they have a “Main” (in name only), as well as some form of card or resource advantage, but don’t have the raw, inherent power of bigger powerhouse sets like Darth Vader and Emperor Palpatine. 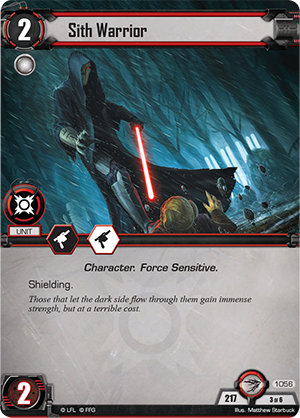 Counsel of the Sith is the quintessential support set: It has no Main, but it trades off having a big relevant unit by giving you lots of card advantage in the form of the objective and Dark Precognition and a powerful trick in Twist of Fate. It even gives you two resources to help make sure the rest of your deck can function. Another archetypal support set is The Imperial Bureaucracy. You’ll notice it looks very similar to Counsel: an objective that gives card advantage, a resource and a couple tactics icons, and some cheap events that help get you the cards you need (though Bureaucracy makes you wait longer for them). Even Supporting Fire can sometimes feel a bit like Twist of Fate, though they do opposite things. A third common support set I’ve seen is The Plan of the Prophetess, which trades card advantage for more on-board advantages. The objective helps you control the Force, the chud helps you attack against non-Jedi, the resource is the best resource available to Sith, and it has solid removal and a great combat trick in Seeds of Decay. The thing none of these objective sets give you, however, are conflict-ready units. Sure, they have some squishy tactics icons between Sariss, Sate Pestage and Advisor to the Emperor, but none of these are people I’d want defending an objective on their own. This can be a real problem when paired with other Sith objectives that either have one incredible unit and not a great chud (Core Vader or Mara Jade) or sets whose Mains are so expensive they can be prohibitive in the early game (Core Palpatine, Sith Executor). The tradeoff that Sith and Jedi have always made is that because they have such incredible Mains, they lack a certain amount of consistency. Sometimes your best unit to start the game is Sariss and you just have to pray that Brainiac or Rebel Assault doesn’t show up, or you’re stuck playing Dark Side Apprentices until you can draw someone worthwhile. If 20% of your deck is Counsel of the Sith (which has no good battle-ready units), that problem can become even more exacerbated… even with Dark Precognition available. What The Inquisitor offers is a Sith support set that features a very solid Main. If this set had a resource, I think it would qualify as a set with “gas” (rather than a support set) largely because of how good he is once he hits the table. Two black guns and a black tactics means you can enter most edge battles feeling decently good, particularly since his ability significantly improves your draws. This isn’t a card advantage ability—don’t think you can just start walking over your opponent’s edge battles with him on the table. But in a game where decks often include weak cards for objective set balance, and where situational cards are more common thanks to the edge system, being able to upgrade the worst card in your hand is a significant improvement. Ultimately, this is a support set not because it lacks a resource (though that’s part of it), but because it doesn’t really do any one thing very well. All of the big Sith Mains have a theme to them: Vader deals damage, Mara is hyper efficient when committed to the Force, Greejatus focuses units (particularly damaged ones), Boc attacks missions, Jerec kills people not committed to the Force, Gorc & Pic are efficient until they combo with each other, and Palpatine has universally powerful and efficient removal. The Inquisitor doesn’t have any internal synergy the way these other objective sets do: he just has a strong Main, a solid chud, and three very situational enhancements. A Lightsaber on Mara Jade improves her offensive capability significantly. Any lightsaber will do, so the more the merrier. The Inquisitor plus his lightsaber can take down almost any attacker in one hit if you win the edge battle. I do hope you’re using his ability aggressively. Hunted turns Force Choke (ubiquitous with Palpatine and Vader) into a free Jedi Mind Trick. Yes, it’s only one one unit, but on any Main it’ll make it really difficult for that Main to strike. Even Dark Side Apprentices can suddenly stop them from striking. If your opponent doesn’t have many attackers, Bones of a Fallen Master can keep an important objective alive and/or undamaged (by forcing them to attack somewhere else). 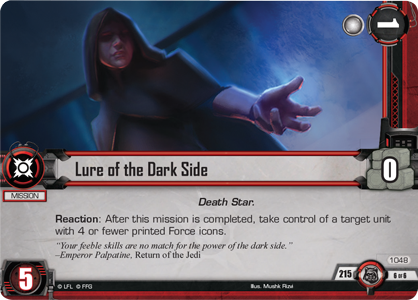 Vader’s new objective, Dark Lord of the Sith, can combo with this to really restrict your opponent’s options to attack. Bones of a Fallen Master also really screws with your opponent’s ability to bait you out with a tactics chud. Unless it’s declared against the Bones’ objective, you can defend with a tactics unit (like Inquisitor!) and prevent them from getting their second attack… and thus damaging all their objectives. Bones can force your opponent into attacking as effectively as Ties of Blood, clearing out their defenders if you want to attack something like Dark Genocide or Lure of the Dark Side. I said that this objective set doesn’t have any real internal synergy, and yet at the beginning I called this an objective set designed around focusing your opponent’s units. Which is true? Both, actually. The set has no internal synergy because it reacts to a lot of different things, but the general idea is to make it difficult for your opponent to strike. Inquisitor has a tactics icon and an ability to improve your edge battle. Hunted focuses its unit when they take damage (whether they’re ready or not). The objective strips elite to make it more difficult for them to commit to the Force or get out from being buried under tactics icons. And the one-cost chud has a kind of black tactics with a downside… but it’s not really much of a downside. Your opponent might get to choose who gets the tactics icon, but since it has to go on a ready unit you’re guaranteed to get maximum strike economy out of this cheap, cheap unit. I’d call this another feature of a support set: it doesn’t do much on its own, but it does keep your opponent off-balance enough to make the rest of your deck push more smoothly to victory. This isn’t a control set anywhere near the likes of The Emperor’s Web or The Tarkin Doctrine, because its cards are much more narrow and easier to play around, but it hinders your opponent and makes them struggle to gain ground faster than you, keeping the board bogged down with lots of incidental focus tokens until suddenly you’ve burst out with some heavy targeted strike attacks or a completed Dark Genocide to seal your victory. And while it doesn’t have cards that interact with each other, a lot of these units and enhancements interact really well with cards in other objective sets. * Dark Counsel – I actually think this objective set is incredible, and the only reason I don’t run it in my current mono-Sith build is because it plays very poorly with The Reawakening set. That said, it’s basically God’s gift to the Inquisitor. Janus Greejatus loves to deal direct damage to Hunted targets while he applies his actual combat icons to other targets. Imperial Functionary will prevent your opponent from protecting damage meant for a Hunted target. A resource makes up for the one The Inquisitor lacks, and the set’s only weakness (Battle of Endor) is exactly the kind of thing you’d want to cycle with the Inquisitor. My favorite is using Administrative Detainment to focus a unit attacking into the Inquisitor after they won an edge battle they thought was important (but which you bluffed with bad cards), which you then follow up by hammering them with three or more black icons.Alternatively, if Encounter at Stygeon Prime is on the board and your opponent happens to have a damaged Character, it’s trivially easy to suddenly Detain them for two turns while you clean up the rest of the board. Using Administrative Detainment can even make up for the fact that Stygeon Prison Guard can’t build up focus on a single unit (strike first with Guard, then detain them further). If I want to build a focus-heavy Sith deck, and I’m going to once this box releases, it’s starting with Janus Greejatus and the Inquisitor. * The Emperor’s Web might be a bit of a surprise, but if focusing people is your jam then this is where you want to go. Cheap protect does wonders for The Inquisitor’s three black combat icons, making it that much harder to kill him before he strikes. The resource is always needed, Force Choke becomes incredible when hitting a Hunted target, and when you’re throwing around all these random focus tokens, Force Lightning becomes that much more effective. Emperor Palpatine obviously really likes to put three focus tokens on the board when your opponent’s units don’t have elite. One thing I want to mention here is that I think The Inquisitor is excellent with Core Palpatine, but not all that great with Box Palpatine. Yes, Box Palpatine is generally better as a unit than Core Palpatine, but Box Palpatine is much more focused around punishing enemy units committed to the Force, and The Inquisitor couldn’t care less about who’s committed and who’s not. Given that Box Palpatine’s objective set is much more narrow, it’s unwise to pair a narrow set with an eclectic, situational one like this one. You’re just too likely to end up with situational cards that don’t match the situation at hand. Box Palpatine has his place, but I don’t think it’s alongisde The Inquisitor. * Agent of the Emperor is one I mentioned earlier, but it’s worth reiterating because it has some excellent value. Bones of a Fallen Master can go on other objectives to help keep the objective online longer, and the lightsaber can go on Mara Jade to make her reach maximum deadliness. Mara has the resource the Inquisitor needs, she gives him some protect, and Rage is always potent. Meanwhile, the Stygeon Prison Guard can help clear out your opponent’s defenders so Mara can get in unblocked with targeted strike. * Plan of the Prophetess will be my last suggestion, though I could keep going. Both are support sets, but both are support sets that operate in opposite directions. Sariss’s set is good because it has removal, an incredible resource, Seeds of Decay, and an incredible objective. However, her units are quite poor. The Inquisitor has two excellent units, though his enhancements are uncomfortably situational. Pair them together, and you find yourself with a solid Main in the Inquisitor, two incredible objectives, the best resource in the game (for Sith), and solid removal, lots of focus tricks, and ways to manipulate your opponent’s engagements. A lot of people dislike Sariss because of how weak she and her Servant are (most of the time). The Inquisitor is in a great spot to capitalize on the power of her support cards, particularly the enhancement and objective. Whether you’re looking forward to all the new Sith toys or you’re eager to see how the game changes with new power sets out of Sith and Rebels, I think the Inquisitor is someone who should be on your radar. However, if Rebels is more what you’re interested in, you might want to start paying attention to the fleets they have hidden across the galaxy. Because their shields are about to go up in a big way, and we’ve all seen how powerful shields can be. We’ve started to see that mono-Rebel aggressive builds featuring Solidarity of Spirit, Command and Control, and Shield Generator Assault crop up among the winning lists. The ability to punch out big capital ships and hit the DS objectives hard and fast makes for LS decks that can suddenly win before the Dark Side player’s even gotten their defenses up, punishing players who keep or draw into slow, sub-optimal opening hands. Certainly the free units provided by Solidarity of Spirit can punish weak opening hands, and when those units have a ton of blast it’s no surprise that they can end games quickly. But Capital Ships are a pretty focused bunch, and if they don’t start off strong to a weak opponend and ride that tempo to victory, they can have big trouble actually grinding out a win. Enter, Capital Cover. This is, at its core, a defensive Capital Ship set. It’s missing an important piece (I wish Concentrated Fire were a Hidden Outpost) but considering the quality of the objective and units, I’ll settle for what I’ve got. The objective grants all your undamaged Capital Ships shielding, the Main grants all your undamaged Vehicles protect, and it has a Protection and a support chud that has a tactics and can steal shields from your opponent. Still, for a defensive pod… the MC30 Torpedo Boat is a fantastic attacker. The secret to this objective set is that it’s impressively well-rounded, and can do a lot of great things for you. If you have the objective online, you’re going to have a ton of shields in the early game; while they can be turned off pretty easily, it’s going to go a long way towards making your low edge Capital Ship sets able to punch through their early damage without being focused or killed by three-gun defenders backed up by the edge. It also obviously makes your defensive ships better, particularly the otherwise-underwhelming MC80 Liberty-type Cruiser. If you have plenty of shields, you can also use the signature event to do an incredible amount of offensive damage, but that requires that you have a shield on your unit, that you didn’t spend the shield, that you have the event in hand, and that you have a resource available. That’s a lot of hoops to jump through, but killing a unit and probably destroying an objective is probably worth it. For when you don’t have the stars align, there’s the MC30c Frigate. This guy puts the Core Set’s Y-Wing to shame, not only because it has a second point of health and is Rebel-affiliated (thanks, Endor Akbar! ), but also because being a Capital Ship now is arguably more relevant than being a Fighter. Yes, sometimes you lose out on a card from Rogue Squadron Assault because it’s a Frigate rather than a Y-Wing, but when you can give it shielding with the objective, and decrease its cost to ONE resource with Independence, I think that’s a trade I’m happy to make. The heart and soul of this objective set is definitely the Defiance. While the objective can give out shields, it does so under a number of conditions (everything needs to be undamaged). Shields are great, but even a shielded unit with three health isn’t going to be able to strike when paired up against a three-gun, one-tactics unit like Boc plus lightsaber. That’s where the Defiance comes in. But not only do Rebels get protect Vehicle across the board, they get it on one of the best defensive units in the whole affiliation. Ships are frustratingly lacking in elite sometimes, but Defiance isn’t. They’re often low on both edge and force, so Defiance is a 3-Force elite unit to contest all the Tarkins and Bocs and Mara Jades running around. And should they attempt to attack into your three-Force, elite unit, Defiance has to kill them with before they strike… better than most Dark Side defenders! It even does a serviceable Kyle Katarn impression by having one blast (thank god it’s black) for when you want to add up some damage at the end of the game. Because Rebels are already so flush with blast damage, seeing such a great defensive set is really exciting. What Rebels have struggled with is defending, particularly in an era defined by Dark Side missions and targeted strike, or even Navy decks that can win the game out of nowhere on turn two. Light Side needs more than anything to be able to defend, and Defiance finally gives the Rebels a solid way to do it. With access to a fantastic offensive unit and maybe the best defensive Rebel unit, this is an objective set that already looks pretty great, particularly as it has two sources of shields: the objective (many conditions, requiring everything to be undamaged) and the fate card (a one-time use thing). Still, whenever an objective set comes out on either side that can generate shields it requires a second glance, as shields prove again and again to be tactically more powerful than they should be. The breakout LS deck of 2014 Worlds was a shields deck, and the breakout DS deck of 2015 Worlds was also a shields deck, featuring Asteroid Base and Forward Command Post respectively. I’m not only interested in this set because it can generate shields, I’m also interested in this set because it can steal them. We’ve already seen two excellent units in this objective set, and I’ll admit that the final unit is definitely overcosted for its stats. The MC40a Light Cruiser has the statline of a vanilla 2-cost unit that we’ve seen many times: 2 cost, 2 health, and for its damage icons. That this unit costs 150% what it should is a huge drawback, enough to make it often not see play. Fortunately it has an extra edge icon to make it not completely worthless. Where this card comes in handy, however, is when it’s put up against an opponent’s shielding strategy. Some Dark Side decks are built around shields, like the NYC/Tulsa Capital Ship deck that steamrolled its way onto the top tables at Worlds last year. But most aren’t, most are just decks with generic good stuff in them. As you can imagine, shields are often a big part of that good stuff. Death Squadron Star Destroyers are all the rage in Navy right now, as are the potent DP20 Corellian Gunships. While Death Squadron Star Destroyers can come and go as the metagame demands, I expect to see DP20 Gunships in Navy decks until the end of time, because that set is incredible. Even Sith wants to share in the fun, with units like Mara Jade and the upcoming Sith Warrior that I expect to see in Sith decks left and right going forward. Only Scum doesn’t play the shields game, but then Scum’s always been an affiliation that gives Rebels headaches. I wouldn’t call the MC40a Light Cruiser a good card, to be sure, but the value I see in it doesn’t come from the fact that it can shield itself. I think the greatest strength of this card is the ability to strip shields off of enemy units so you can then kill or tactics them to infinity. After all, once this is on the table your opponent is going to be unlikely to want to ever trigger their shielding keywords, meaning the threat has done the bulk of the work for you. That it has a tactics icon also shouldn’t be overlooked… tactics is a rare thing in Rebels. I’m eager to see how this set plays out, because I have high hopes for it. I’m going to finish this by talking about some objective sets you might want to run with Capital Cover, just like I did with the Inquisitor. I think you’ll find some interesting gems in here, in addition to the obvious good stuff. * Command and Control is the obvious choice. When your objective set has three capital ships in it, you’re going to want a four-cost unit with three blast and shielding that makes them all cost 1 less. It’s like they designed Independence with the sole purpose of making it synergize as much as possible with the rest of the objective set, right down to the fact that it has shielding to fire off Concentrated Firepower. But when Capital Cover is online, even the Corvettess start to look pretty nice, considering their black icons really don’t care whether or not they win edge. Finally, while Resupply Depot is obviously good with any vehicle, it really wants to be used with something that’s cheap and can threaten multiple angles of attack, and the MC30c is about as cheap as it gets: 2 resources with the ability to be reduced to 1. The only problems I foresee with this pairing is the lack of resources and the edge weakness that you take on when you include Command and Control. * Preparation For Battle is an objective set that I personally adore, but everybody seems to write off as being bad. How bad can it be when it has two units with shielding, passable edge, a resource, an an objective that says “units you control can’t be damaged OR they gain blast?” Yeah Hoth Scout can be a stinker sometimes and your resource is SUPER vulnerable to being Choked on arrival, but it gives Rebels access to a bunch of tactics they’re often lacking and shields to help fire off both the event and to help keep your objectives and vehicles undamaged. You probably don’t run this set as a two-of—as good as the objective is, neutral objectives are miserable and the set technically has zero blast—but splashed in for value, I think this can really improve your viability in matchups that don’t start with you bearing down on your opponent like the grim reaper. * Turning the Tide almost feels like a cheat to suggest… frankly I’m mostly just saying this because it’s one of the best Rebel sets I’ve seen in a long time so why not include it here? Akbar buffs all three ships in the set, and the cost variety between the one-cost B-Wings and the 2/3/4 cost Capital Ships gives you plenty of flexibility to deploy your threats at maximum volume. Both sets have three-Force elite Mains to help take the Force, and if you have the edge then Akbar and Defiance can both do brilliant work playing defense while the rest of your fleet bombs the dark side objectives to oblivion. There’s not a ton of direct synergy here, but I have a very strong suspicion that I’m either going to be playing a lot of decks with these two sets or playing against these two sets a lot. Together they just give you a ton of flexibility. * Green Squadron Deployment — Now here’s one you didn’t think you’d see again! But when you think about it, I think they actually go together brilliantly. Green Squadron Deployment gives you a resource that isn’t limited, another Main that can control the board, an event to help you reuse your incredible main when they finally kill it (Defiance), and an objective that takes the already-strong Force presence of this set and dials it up to 11. Seriously, the number of times I’ve deployed Akbar or Home One and had no good attacks but been up against a committed Boc/Mara Jade, meaning I couldn’t even take the Force if I wanted to, has been a lot more than I’d like. It’ll be the same with Defiance… but now Defiance can have SIX FORCE ICONS for the low-low cost of an objective. I said that this was a strong set for Rebels because of how defensive it was, and defense is only relevant if you can hold the Force. It’ll be difficult to take the Force from a committed Defiance with Green Squadron backup. Especially when Echoes of the Force is messing with your opponent’s commitments the whole time. In less than a week, Galactic Ambitions is going to be released in the US, and become tournament-viable for the rest of the world. If you’re not as excited about it as I am, I think you should seriously look closer at this box: it has a lot of really relevant objective sets that are going to seriously change the metagame going forward, and this time they’re going to be prevalent in both affiliations. Obviously Darth Vader is going to factor into a lot of that, but I strongly suspect that The Inquisitor, The Black Squadron TIEs, General Dodonna, and The Defiance are all going to be just as important going forward. And that’s not even mentioning the incredible utility opened up by the Smuggler, Scum, Navy, and Jedi objective sets! Get strapped in, because this is going to be one hell of a fight for the Galaxy! Join me again in two weeks, when I have the first of two Release Reviews for this exciting deluxe expansion!